Bub Maietta's Dubois Senior World Series team stayed alive in the 1986 tournament and Maietta pointed to a walk and an error that got his team going, according to The Orlando Sentinel. Maietta did his part for his Dubois 13-15 team earlier in the game to get his team going: He hit a solo home run. He went on to do his part in high school, enough to get notice as one of the top high school prospects and turn pro. In the pros, though, Maietta never really gained traction. He played three seasons. He never made AA. Maietta's pro career began in 1989, taken by the Tigers in the 11th round of the draft out of Dubois Area High School in Pennsylvania. Maietta is also credited by his given name, Ron Maietta. At Dubois, Maietta also played football. He remains third on the school's passing record list. On the Dubois baseball field, Maietta won Scholastic baseball player of the year honors for Pennsylvania in 1989. He also made a high school prospects baseball card set. He went 9-1 his senior year at Dubois, with a 1.29 ERA. He made the U.S. Junior National Team in 1988 and the U.S. Olympic Festival in 1989. In the pros, the pitcher started with the Tigers at rookie Bristol. He got into nine games, started three, with an ERA of 3.71. He returned there for 1990, getting just six starts in a brief campaign. Maietta and a young Tony Clark roomed together for a time. 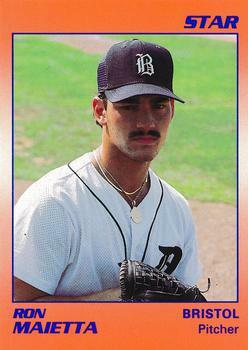 Maietta moved to the Red Sox for 1991, what turned out to be his final season. He played between the rookie Gulf Coast League and high-A Winter Haven. He went 2-5 between them, with a 6.21 ERA, ending his career. Maietta made one more bid at sports, years later, back in football. Attending Youngstown State in 1996, The Indiana Gazette in Pennsylvania reported he expected to make a bid for the schools gridiron team that fall.